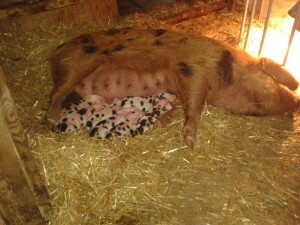 Maple is in pig with her piglets due during the second week of March. All the pigs are safely off the mud and tucked up indoors with lovely cosy beds keeping nice and dry for the winter. Having wanted to do this for a long time we finally managed to have a lovely walk in The Borough Valley near Mortehoe one day. We parked down at Lee and had a picnic overlooking the sea followed by a wonderful stroll up the valley through the secluded ancient woodland. 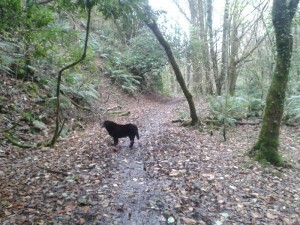 Tavy had a lovely time, perfect for her since she is not that good on hills any more. We stopped for a cup of tea overlooking David Kennard’s farm (creator of the TV character Mist) and had a bonus of finding the hedges heavily loaded with nice fat sloes. Great for sloe gin. If you haven’t tried it yet you must put it on your bucket list. 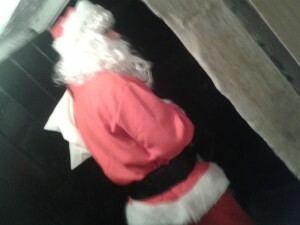 Farmer Christmas paid our Christmas guests a much enjoyed visit again this year. Managed to get a quick sneaky picture of him this time! We have met some wonderful people who have come to stay with us this year and we would like to thank you all for making 2015 such an enjoyable one. Happy Christmas and a Happy New Year to all. 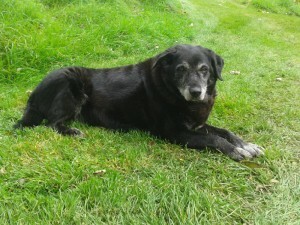 Tavy celebrated her one hundred doggie years birthday in October. She didn’t receive a card from the Queen but had a lot of lovely comments and best wishes from all her friends on Facebook. Meanwhile we were being organised and have made our Christmas cake and puddings using Nanny’s pudding recipe and the cake recipe that we had for our wedding (Oh so many years ago!). We have been spending a lot of time getting the gardens ready for winter so that they will have a head start in the spring. The colours of the tree leaves are magnificent at this time of year and the fantastic weather has meant that we have been able to enjoy the spectacle whilst being outside. 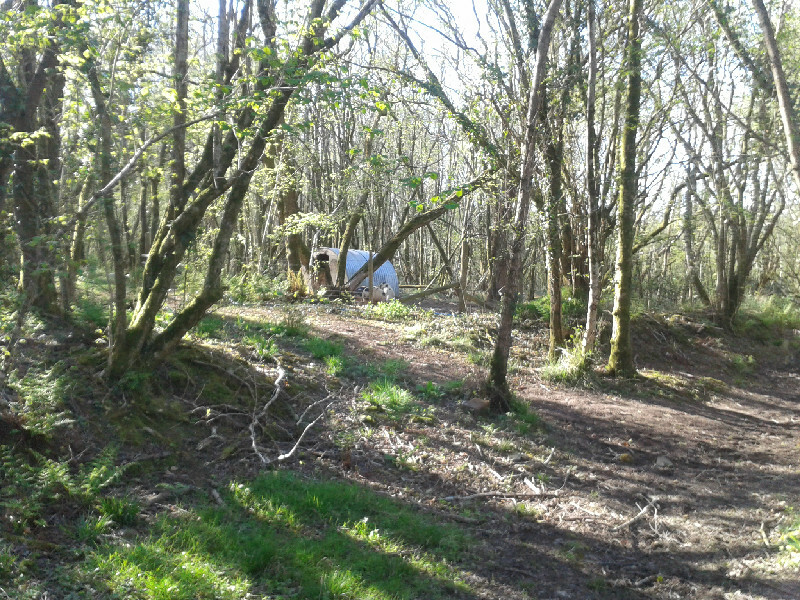 We found a gem of a place to have a walk nearby on Exmoor this month. Anstey Gate, which is just above Molland and only a 30 minute drive away, is a wonderful spot on the edge of the moor. 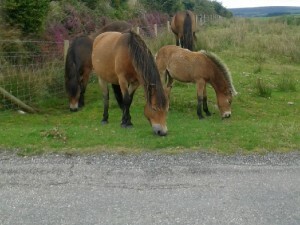 We were delighted to see some red deer whilst on our walk and some beautiful Exmoor ponies with their foals who came to say hello. We said farewell to Geoff, Geoff and Geoffwena when they moved to their new home near South Molton. They will have the run of 50 acres of woodland and will have a wondeful time enjoying the acorns and other wild titbits available. Holly, Molly and our Geoff are still with us and growing quickly. 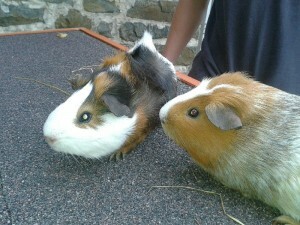 The Guinea Pigs, Fudge and Treacle, are growing rapidly and really enjoy their cuddles with the children at feeding times. 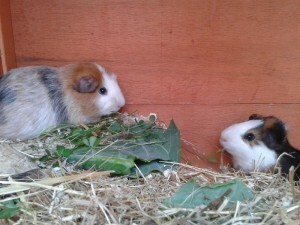 We welcomed an exciting addition to our farm in July with the arrival of two guinea pigs. They are called Fudge and Treacle. Every one is enjoying guinea pig cuddles and getting them used to being handled. Acorn farrowed 6 piglets who are enjoying life in the barn and playing with the children at feeding times. We are keeping two of the girls to grow and live here as additional breeding stock. The children on the feeding runs have decided to call them Holly, Molly and the little boy who will stay with them for a while Geoff. The other three are called Geoff, Geoff and Geoffwena! 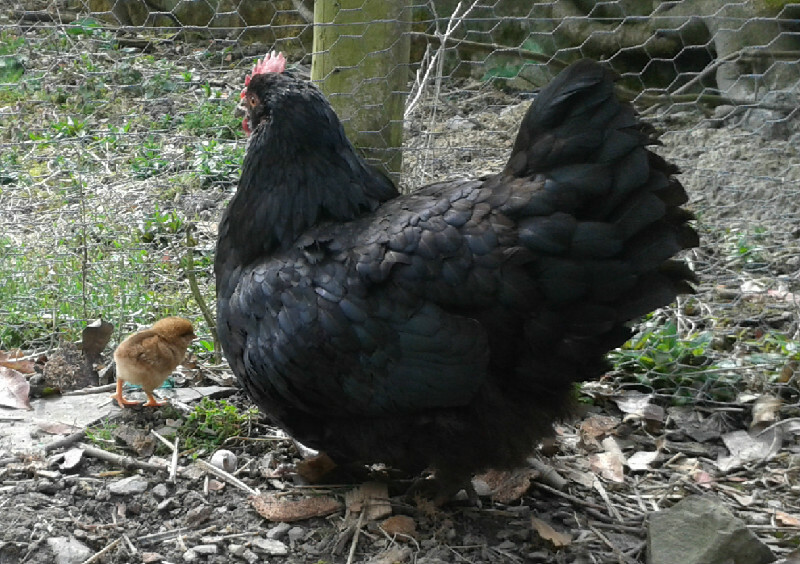 One of our chickens who had been absent without leave for a few weeks suddenly appeared with a brood of ten adorable chicks trotting behind her. She is being a very good mother trying to look after them all. 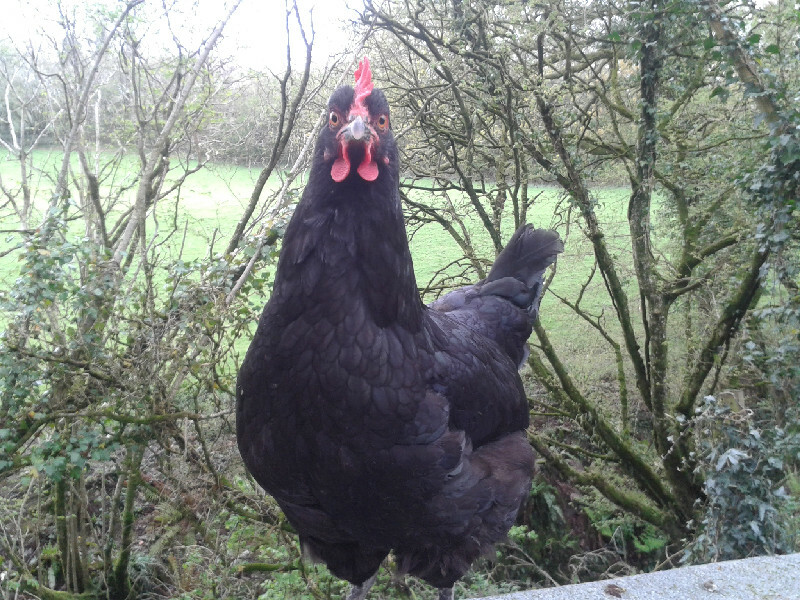 We all know that a chicken’s maths ability is very poor so you can see her counting “one, two, more than two”! We celebrated ten years at Lower Hearson Farm this year and Maple rose to the occasion by presenting us with a litter of 8 piglets. Our new set of swings arrived and they are now being thoroughly enjoyed in the play area. There was a good show of elder flowers this year which produced some wonderful elderflower cordial. A special summer treat that never lasts very long. Delicious with still or sparkling water and ice cubes. There was a first for Lower Hearson Farm this month when a couple staying here announced to us that they had just got engaged whilst walking in our field. So romantic, he even went down on one knee and presented a ring. Great news. 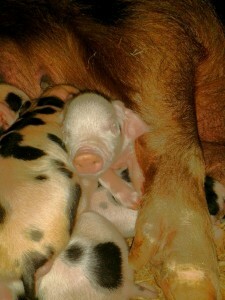 Acorn is in pig with piglets due in August. This will be her second farrowing this year and she is a very clever girl. She is having a relaxing time in the field enjoying the spring sunshine. The Linhay is sporting some new vinyl flooring in her bathroom and is looking very smart, bright and airy. 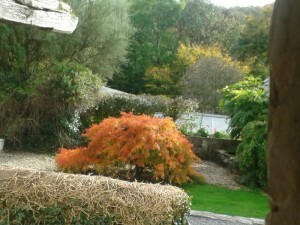 A lot of time is being spent keeping the gardens and allotments in good shape. The pigs kale has been sown ready for their winter greens and the fence erected around it to keep the sheep out who would love to get in and nibble the fresh green seedlings. It is just like a patch of sweets to them. Phoebe was not pregnant sadly so she is now officially retired and enjoying a well earned rest after 6 years of piglet production. We ordered some new swings for the children’s play area. 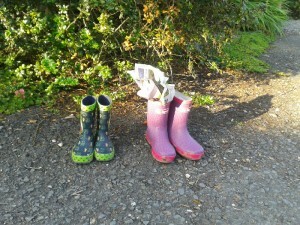 We are very excitedly awaiting their delivery in June. They should be great fun. May half term was an absolute hoot with our regular friends and some new friends having a wonderful time feeding the animals, enjoying the farm and the rest of North Devon. 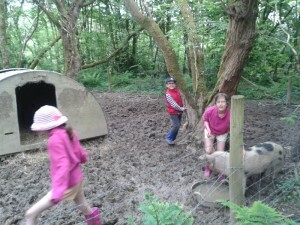 Acorn’s piglets are now in the woods playing happily in their enclosure and having a really lovely time. 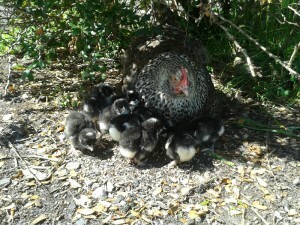 Our incubated eggs hatched on Good Friday and were well cuddled by the end of the Easter holidays. The children each had their favourite that they liked to hold and the chicks are now very used to being handled. It has been an incredibly warm month with hours of sunshine to enjoy. Phoebe, Maple and Acorn were moved out into the field onto fresh grass. 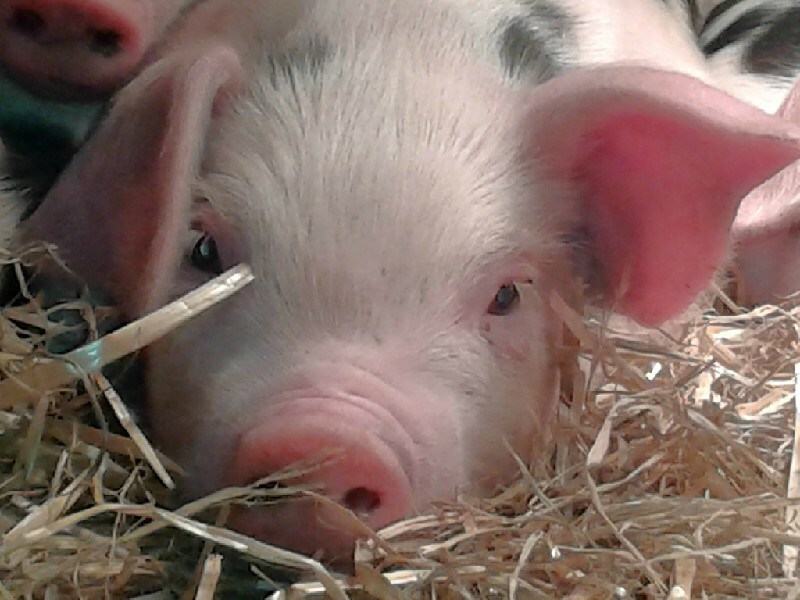 They are having a wonderful time after their winter confinement in the piggy palace! Maple is pregnant with her piglets due in the first week of June. Phoebe might be pregnant. Old age (hers not ours) is making it difficult to be sure. If she is, piglets are due on the 18th May. The land for the pig’s winter kale has been ploughed and worked down with a harrow ready for sowing in May. 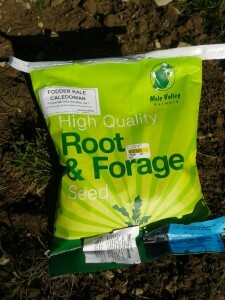 It has been so dry we have been able to get on with it earlier this year. We managed to grab a rare afternoon off and nipped down to Castle Hill Gardens, the country estate of Lord and Lady Arran a 10 minute drive away from here. The rhododendrons, azaleas and camellias were breathtaking and we had a thoroughly wonderful afternoon in those gardens. They are well worth a visit with the added attraction of being so close to here. The Grain Store’s bathroom refurbishment is completed (just in time, as always). It makes the room look really light and airy. We are very pleased with the outcome. After battling for years with twitch grass in the flower bed in front of The Shippon we finally decided drastic action was needed. The flower bed was totally cleared, the beautiful roses cleared and healed into the allotment for safe keeping and a weedproof membrane is now sitting over the soil to be covered in chippings later in the spring. This will subdue the weeds and then later in the year we can replant the roses back through the membrane between the chippings. This will make the whole area more manageable for us and better looking for you, hopefully. It was a really sunny month and we found that one of the chickens had secretly been sitting on some eggs and presented us with a single chick one morning just before the Easter holidays. A big thank you to our son who spent 2 whole days re-fencing the outside of the chicken pen whilst we were locked in Grain Store’s bathroom. It is all looking very smart indeed. 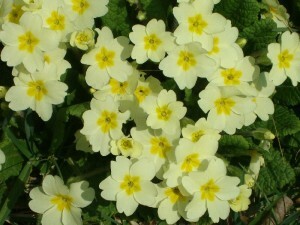 The days are gradually getting longer with more spring flowers starting to appear. 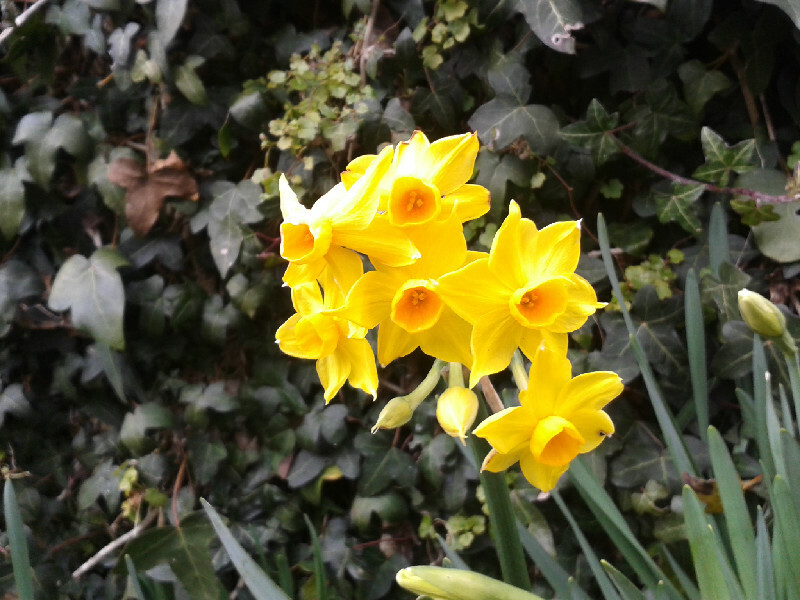 The daffodils are making a tentative sniff of the air and even some early primroses are appearing. We started buying in the larger items for Grain Store’s bathroom this month. Successful delivery of the bath by two very brave delivery men who couldn’t get their massive lorry down the lane but showed valour beyond the call of duty and carried it all the way down. 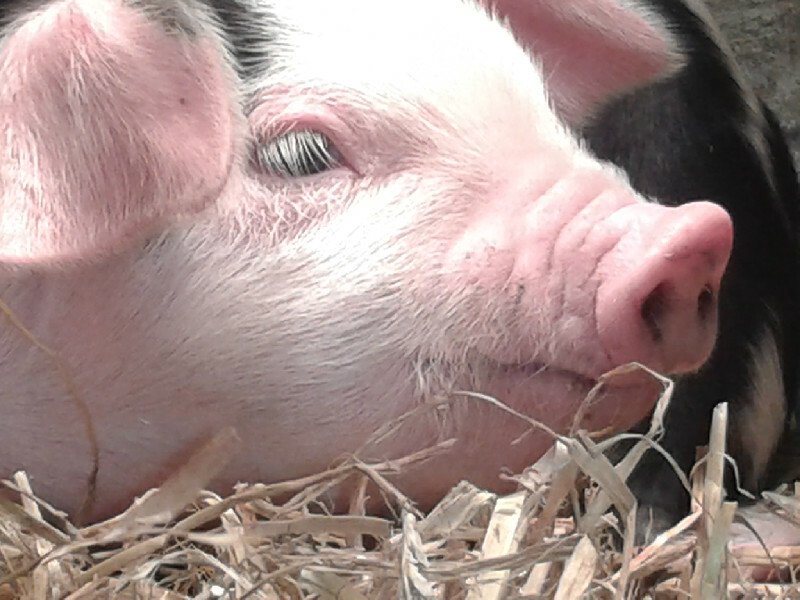 The piglets were weaned from Acorn during Half Term week and she is now enjoying a well earned rest. 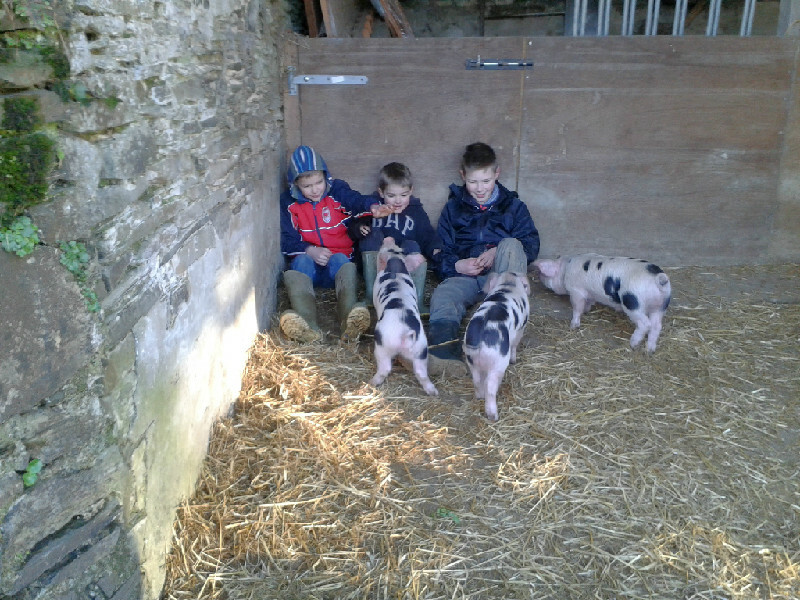 The piglets are enjoying the attention of our younger guests during the morning and evening feeding sessions. Exciting News. Acorn farrowed on the 10th January. 7 gorgeous piglets delivered safely. They have been in the barn lovely and warm and cosy with mum and are growing before our eyes. We ventured into the realms of You Tube and posted a video clip of “chicken tea time”. Need to get some piglet clips posted as well. Subscribe to the Lower Hearson Farm Channel to see future videos. Everywhere is covered in Snowdrops and we may spend some time quietly dividing them to get them to spread further. It takes many years for them to spread by seed. We love it when the Snowdrops come out as it is a sure sign spring is on the way and the days are starting to get longer. The garden is covered in birds and the birdsong echoing around the gardens at dusk is breathtaking.We have been indoors working hard redecorating Roundhouse’s bedroom and it looks lovely. Next on the list is Grain Store’s bathroom with a new toilet, bath and shower. There is always something here to keep us busy!